For the past few days I was away from my computer. The picture of the completed tunic was already on my earlier post. In this post I am uploading the different views of the same. 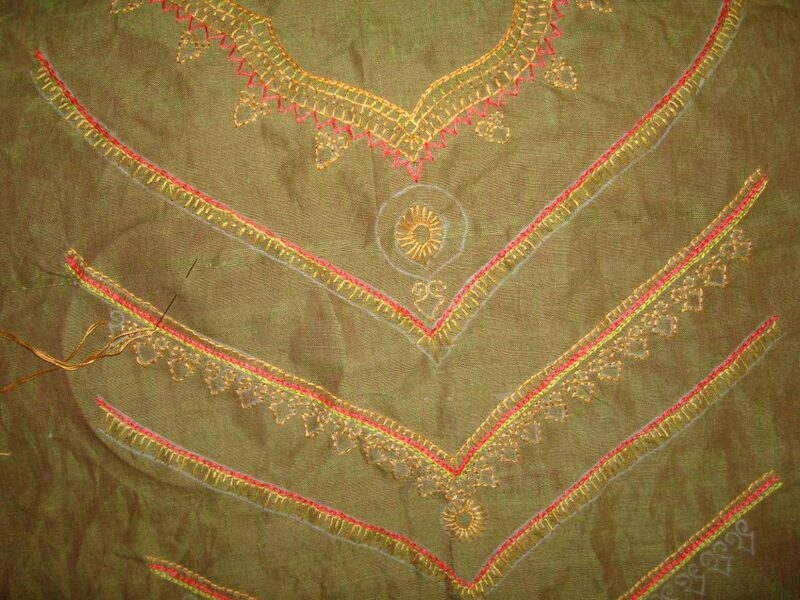 The tunic with the salwar fabric as sleeve border. 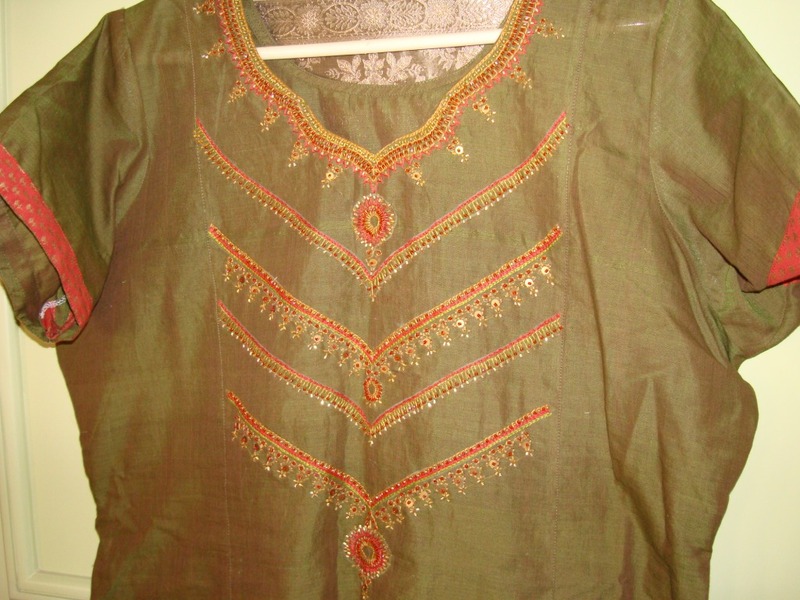 This tunic is completed and has been worn a few times also. The beads have lost some of their sparkle, because of the wash, I suppose. I don’t use these beads nowadays for tunics. I use different antique golden beads, they don’t sparkle, But they come beautiful shapes. I love this green colour. The salwar was in red with kadi print, the sales woman told that , the print may not last after washing, but , that did not happen. Life is full of surprises. 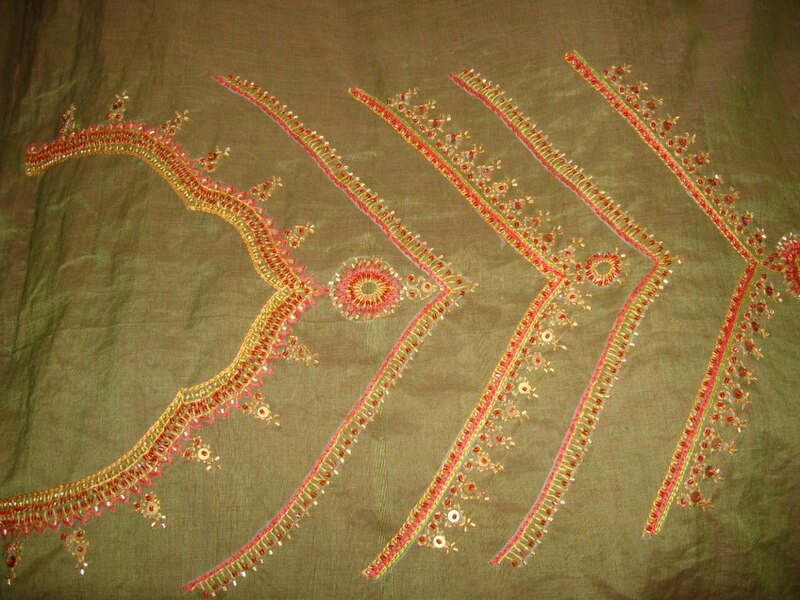 The embroidery stitches part of the design is completed. 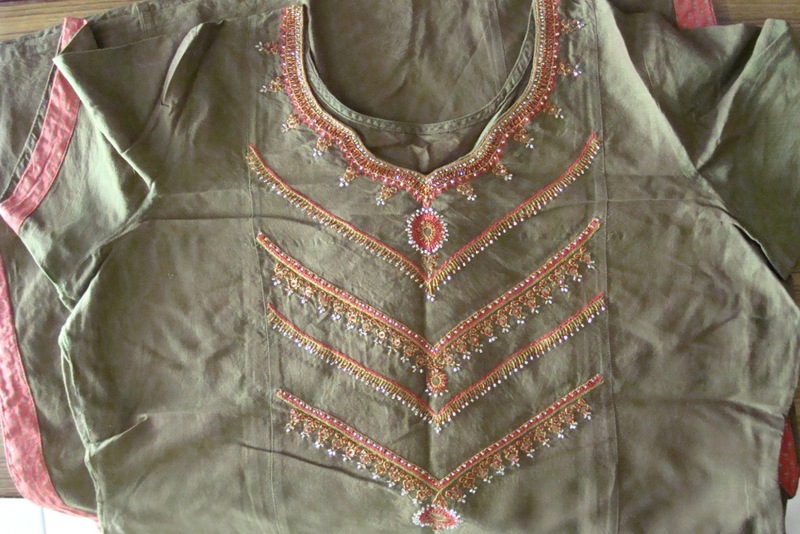 The other lines had more hanging motifs than the neckline, the working of the motifs with gold and red beads. This is the close up of the medallion design with beads. 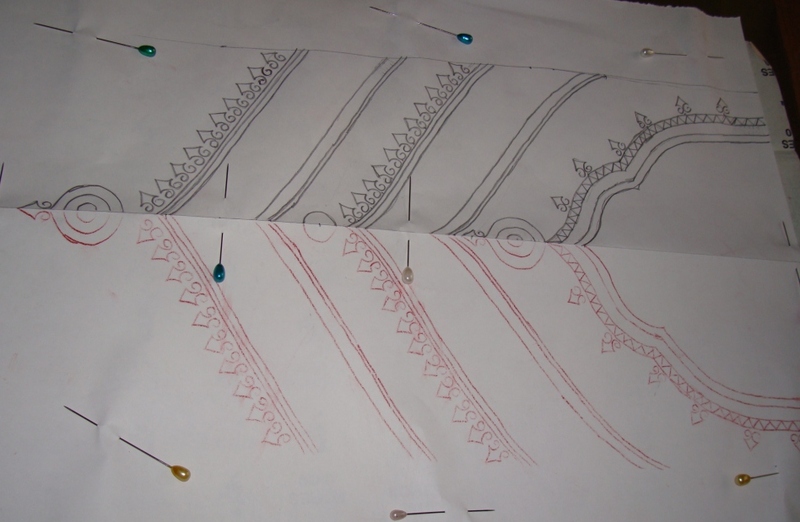 The work on this necklace pattern is fully completed. On my next post , the pictures of the completed yoke and sewn tunic will be uploaded. 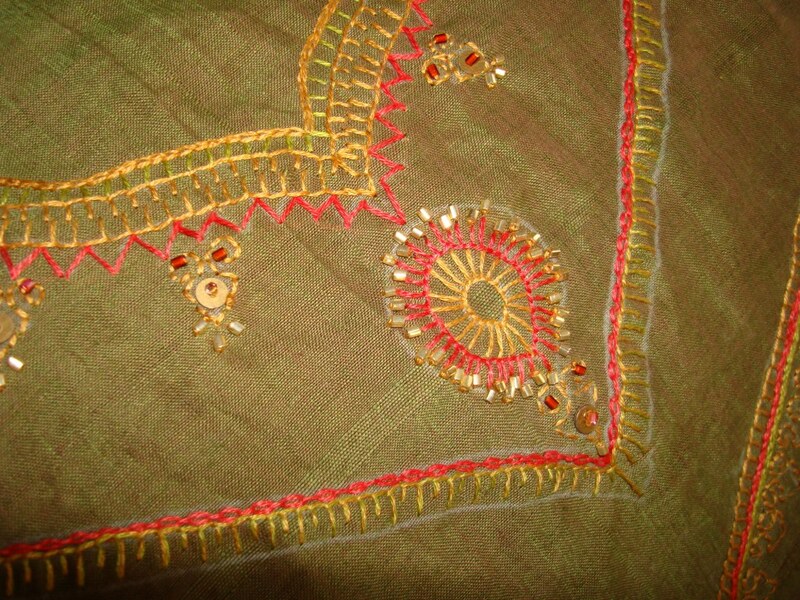 When I was working on this embroidery, I thought of detailing the progress of this project.So , I took pictures. I also learnt something else – I have the record of the progress, which can be used for reference , if I want. I could see how the pattern looked without the gold beads,without the motifs. Sometimes when we use more than two colours, it is very interesting, how each colour affect the developing pattern. These days I take pictures after working each and every colour. 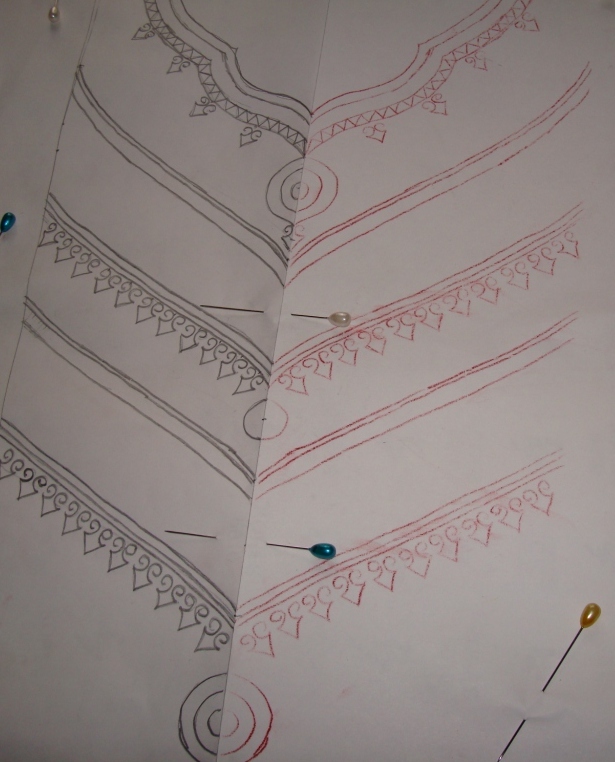 In this necklace pattern in embroidery, I have done detailing the green thread in my last post. As I have mentioned earlier, I had not taken pictures of all the details . there could be jumps here and there. After the green thread I started with the golden yellow thread. At that time I was working only with anchor cotton skeins. Whoever wants to use this idea can incorporate the silk and metallic threads instead of cotton skeins. 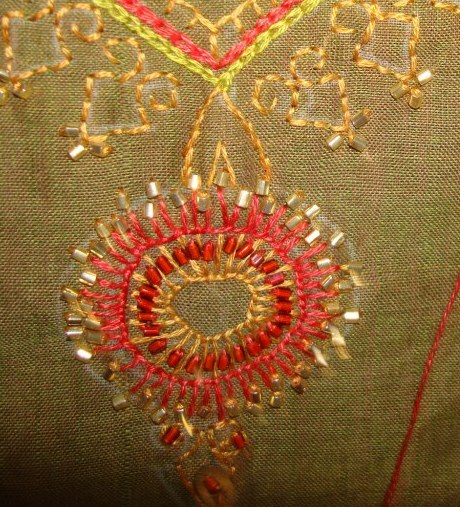 wherever two lines of chain stitches done in red and green, they are headed with a line of buttonhole stitch in yellow.And on the lines where single line of chain stitch is done in red , a variation of buttonhole stitch[ long and short] is worked in yellow and green colour joined together. 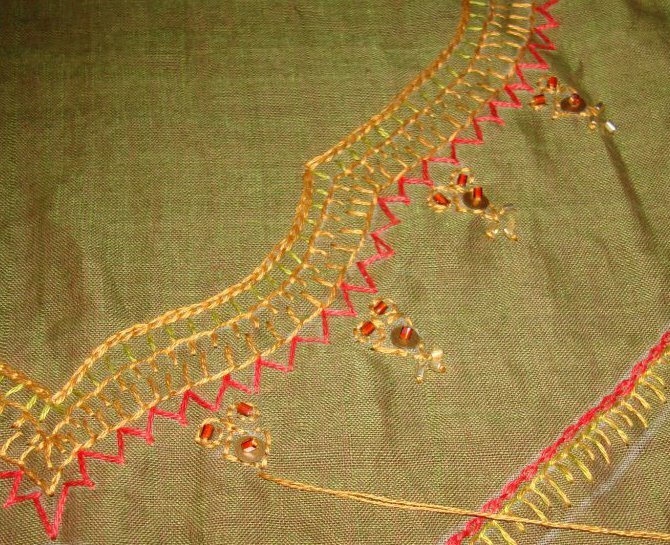 For the neck, straight stitches are done in green, over that a line of chain stitch is worked in yellow. 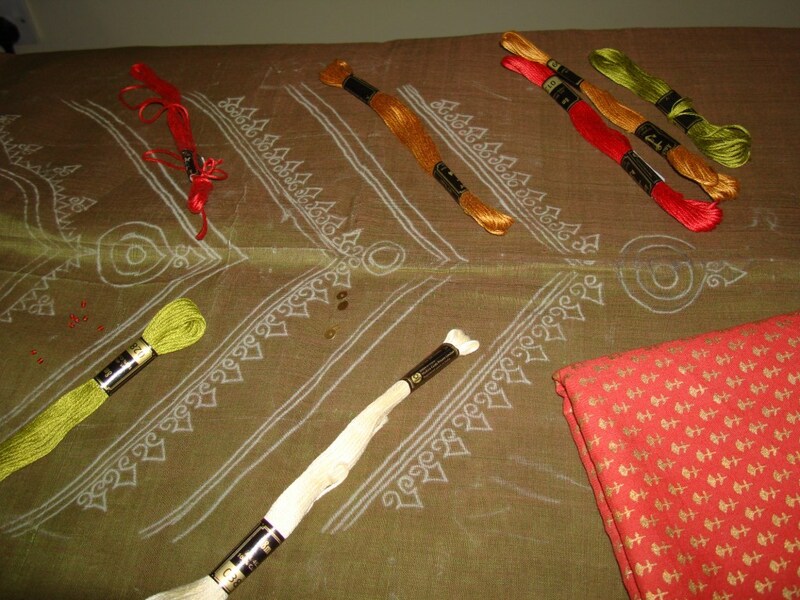 The same yellow thread was used for working the back stitch for the small hanging motifs too. 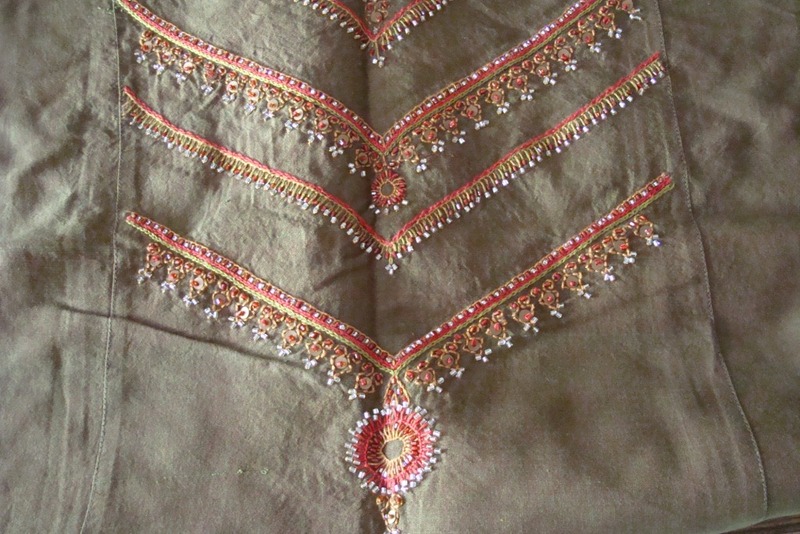 On the neck pattern, two rows of button hole stitches [in yellow] are worked facing each other. 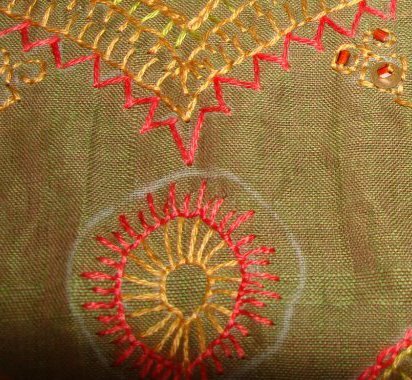 And this is the detail of the medallion from the necklace pattern-After working buttonhole stitch in a circle, a line of butoonhole stitch variation is done in red thread. This was the first time , I took pictures of the WIP of a project. I did not take all necessary pictures. 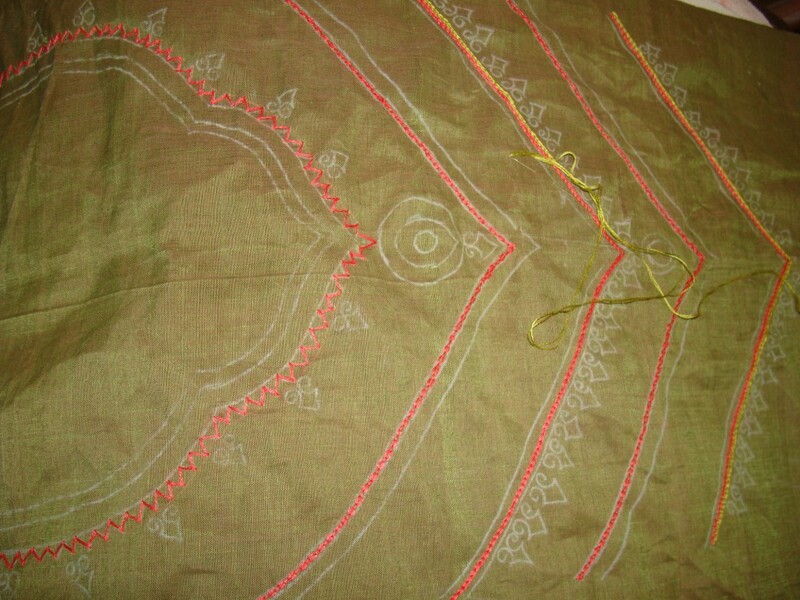 Now for the details, After tracing the pattern , I started with red thread. 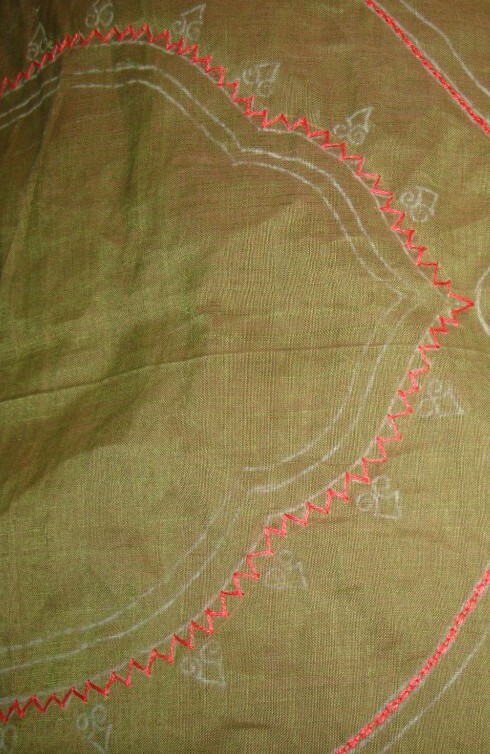 With the same red thread, pattern on the neckline was worked in zigzag back stitch. 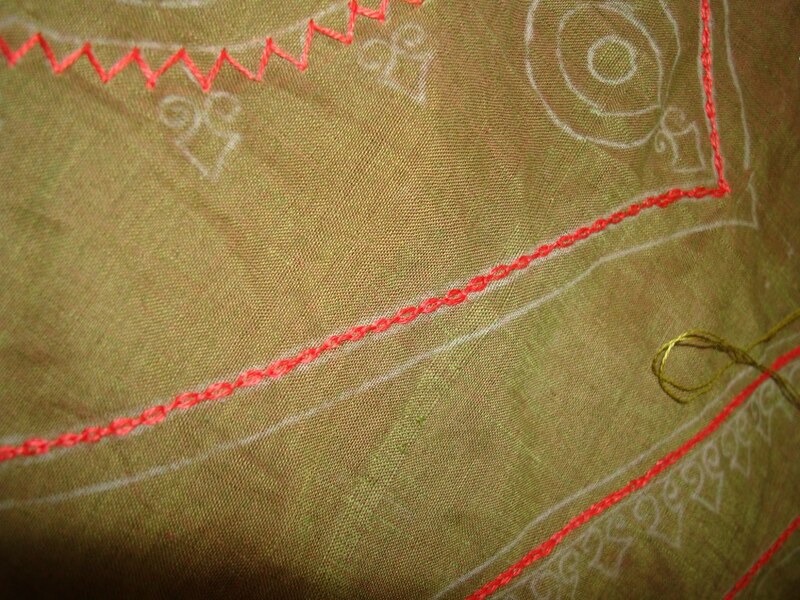 Another line of chain stitch in green is worked on alternate line patterns adjacent to already worked chain stitch in red. 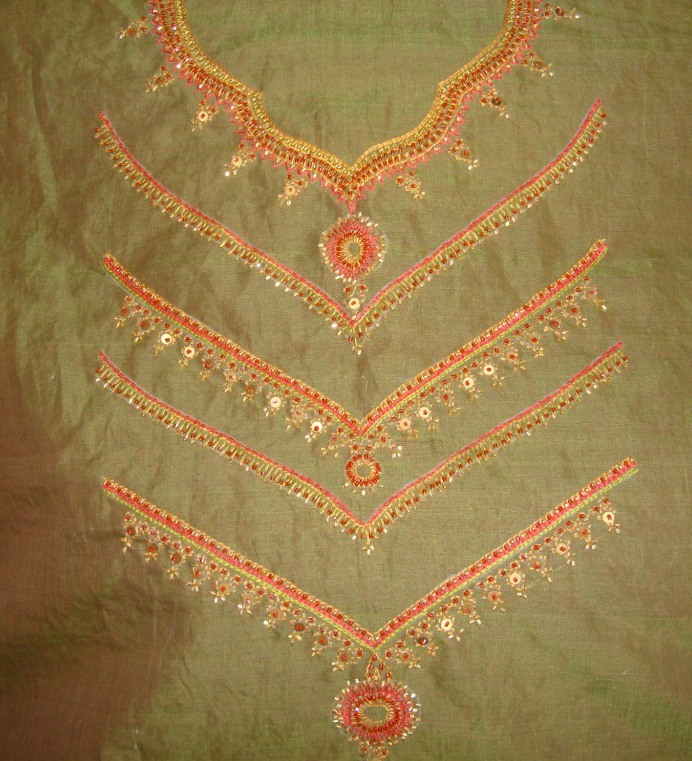 I did this embroidery in 2009, all that I remember about this project was to use gold beads to form a necklace design, now I am able to relive the whole project once again through these posts. 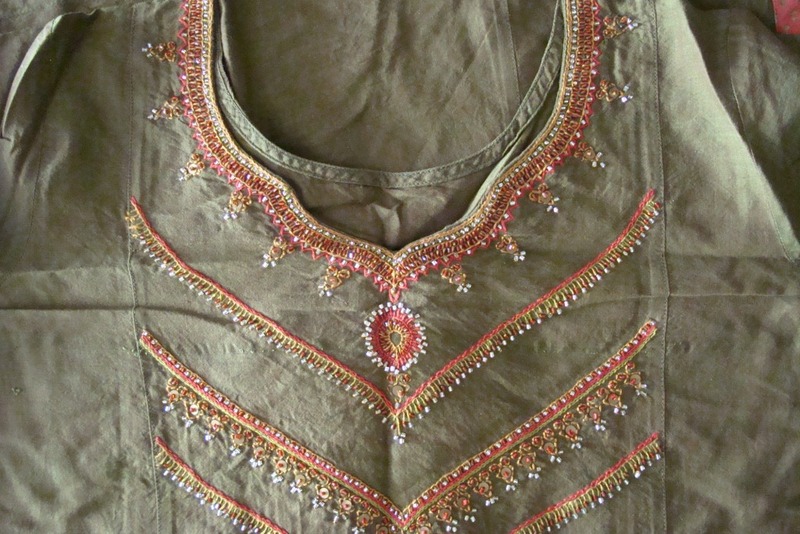 Meena wanted the details of this necklace pattern on tunic. The tunic picture was posted earlier here. I wanted to use line stitches and gold beads to give the effect of necklace . Though I chose cream colour thread here,It was not used , thought it will take away the effect from gold and red colours. 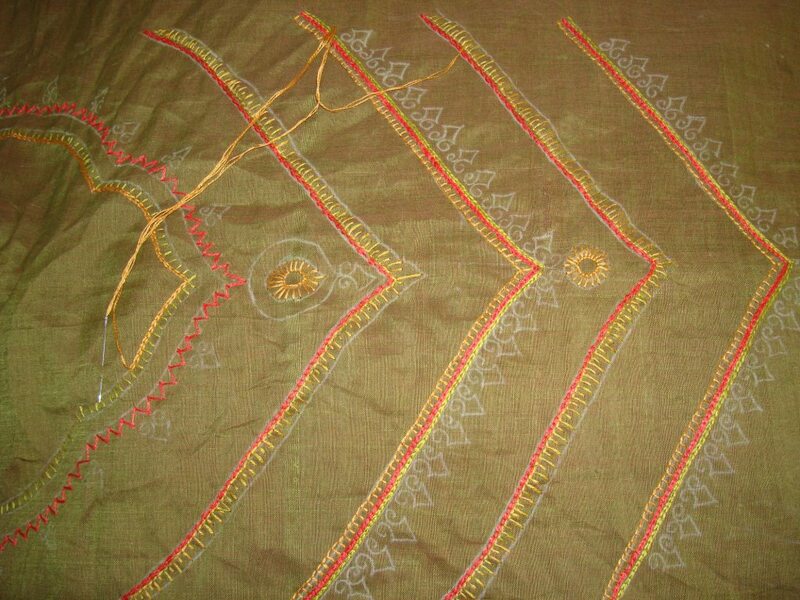 Necklace pattern on green tunic. This tunic embroidery design is a combination of inspirations. I was fascinated by bead work on the net. 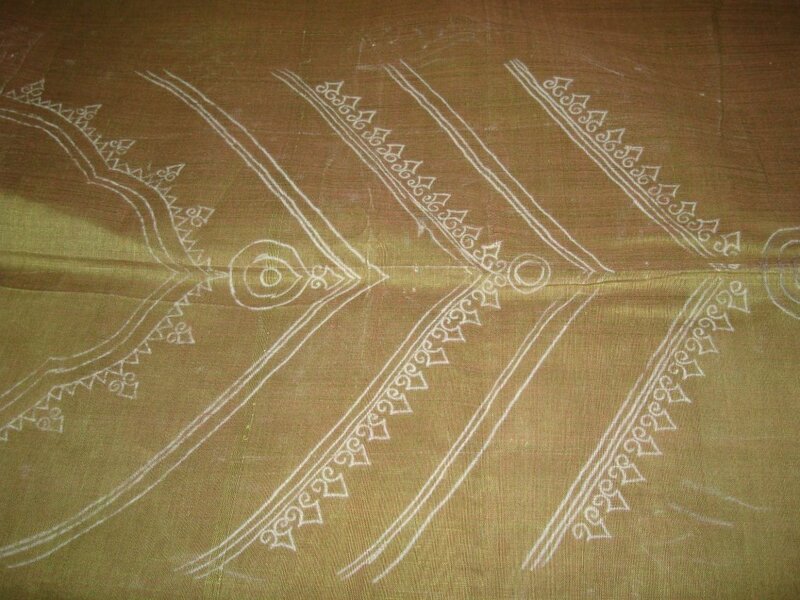 Iam also interested in traditional Indian designs. I had seen some people doing jewelry patterns on frames based on Tanjore painting style. So with the above combinations, the result was few lines of jewelry inspired beadwork. I used small gold beads only, no stones. The pattern was just lines , where I worked the line stitches to go with the necklace theme.Except where I wanted something hanging down, I used a small curved motif. I used gold and red colour threads. I did not plan the list of stitches, but just went along with the basic idea.